Following on from last week, despite my comments, it was City who got the upper hand in the Manchester derby. However, despite the result on Monday, with Manchester United still 12 points clear in the Premier League with only seven games to play, it’s almost a certainty that City will lose the title they won for the first time in 44 years last season. So much has been written about why already. City manager, Roberto Mancini, has promised spectacular signings in the summer, having said that missed signings, most notably Robin Van Persie, who favoured United over City, cost them the title. More insightful was a recent article by Jan Molby, who observed that while City have some great players, they are not as cohesive a team as United. 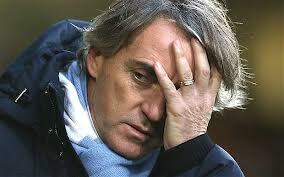 Mancini has not managed squad rotation as well as Ferguson, with United players generally slotting in. United have a talented squad but it is their ability to function as a team and grind out results, even when not playing their best, that has proved a significant difference. Functioning as a cohesive team, of course, only comes with plenty of work on the training pitch and the team’s management being able to communicate a vision of what they want from the players in that context. Blame is a consistent symptom of failure – people looking elsewhere to attribute falling short. This focuses on one issue and usually distracts from addressing the real issues that have led to failure. There are normally a series of contributory factors and determining where improvements can be made across the team. In contrast British Cycling’s Dave Brailsford talks about marginal gains, where they are looking for small improvements across all factors that contribute to performance. I worked with one programme director a few years ago, who’s view of how you get a high performing team was to pull all the best high performing individuals from across the organisation. That may give you a bunch of very bright people but unless you can get them to work as a team they will fail. Greece at Euro 2004 are a stark reminder of what a well organised team can achieve, winning the tournament as 80-1 outsiders at the start of the tournament. This should really come before the last heading but without having a vision of how a team will perform and regularly communicating this to the team there is no uncertainty – they will fail. Of all the change projects we have recovered over the years, one common characteristic is not the lack of vision but the failure to keep communicating it out to all those involved. As blame distracts from true causes, in directive organisational cultures bad news rarely travels back to senior managers (of course in Premier League football it is all too visible). How often do project managers rate projects green or amber when they should be amber or red. Without acknowledging problems they don’t get solved. Of course, there’s been much written about project failure and there are many other reasons, if you want to read further symptoms of failing projects that we’ve encountered see http://on-court.com/failing_projects.html – I’d love to get more feedback on other symptoms/factors that people have observed.